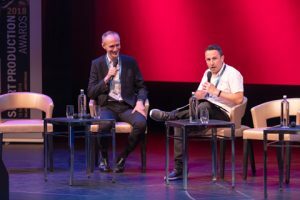 Kicking off IBC on Thursday 13 September, SVG Europe gathered together nearly 500 sports production professionals for a day of discussion on the latest technologies, shining examples of success, and the most pressing issues in the industry. 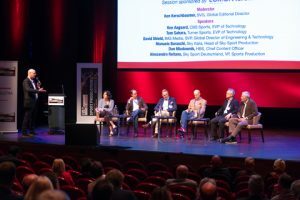 At the DeLaMar Theatre in the centre of Amsterdam, Sport Production Summit 2018 began with a welcome from IBC Director Steve Connolly, who noted that around half of the IBC Innovation Award finalists are from a sports background, underlining the importance of SVG Europe’s role in the broadcast ecosystem. 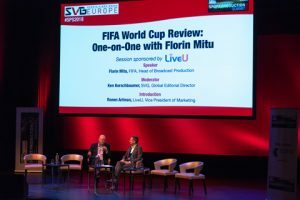 In the first session, FIFA World Cup Review: One-on-One with FIFA’s head of broadcast production, Florin Mitu, SVG’s Ken Kerschbaumer spoke to Mitu about the timeline leading up to the World Cup and how FIFA worked with HBS to pull off the most technologically advanced broadcast production of a World Cup so far. The difficulty – and risk – involved was in going for HDR before it was even “fully baked,” as Kerschbaumer said. Mitu admitted, “this was a bit of a gamble,” and that there, “wasn’t much enthusiasm towards UHD or HDR from rights broadcasters at the beginning”. Even virtual assisted referee was a very late addition to the programme, with permission only being given to use it in Spring 2018 following trials. However, HBS pulled the production and the technology together and the event was a great success. Next up was In DAZN: Disruption, Personalisation and the Future of Televised Sport, moderated by SVG Europe’s own Will Strauss. Ben Lavender, chief product officer at DAZN, spoke about the rapid growth of the OTT live sports broadcaster, which has launched over seven countries in just two years. It streams over 150 million hours per year at the moment, covering 20,000 live events, and is on track to be in 20 countries by 2022. Lavender, who was the inventor of BBC iPlayer, spoke about how the company intends to revolutionise boxing in the US, with over 70 stacked fight nights per year to come, as well as 22 fights from Bellator MMA to appear. Exclusive to SVG Europe’s event, Lavender also announced the details of DAZN’s hottest news; that it will be opening a brand-new office in Amsterdam that will create jobs for 300 people by 2022, with roles including software engineers, development managers, and scrum masters. The new development centre will play a crucial role in the global roll out of DAZN as the home to the R&D and innovation, acquisitions and retention, and third party integration teams. 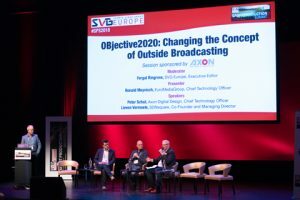 Next up was OBjective2020: Changing the Concept of Outside Broadcasting, where SVG Europe’s Fergal Ringrose had a conversation with Ronald Meyvisch, CTO at Euro Media Group (EMG), Peter Shut, CTO at Axon, and Lieven Vermaele, co-founder and MD at SDNsquare, about EMG’s OBjective2020 plan. The following keynote conversation with Kerschbaumer was Inside NEP’s Launch of the Andrews Production Hub. This project is, in a way, taking the opposite stance to Objective2020, creating a set hub that operators can work from to produce live events remotely, rather than have crew travel around Australia from site to site. Speaking with the rapidity of an auctioneer, Marc Segar, director of technology services at NEP Australia, said: “We have created the hub to alleviate staffing issues in Australia, where a lack of skilled operators means people have to be flown around the country to work. The hub is like an office; people can do their job every day and still see their families.” Yet he added: “Some people like to travel, they love it, they don’t like their families,” he laughed. Next up was the Wimbledon 2018 Review: All Change for All England Lawn Tennis Club (AELTC) at SW19. Here, the team that refurbished the Wimbledon base for AELTC into its own inhouse host broadcast service spoke with SVG Europe’s Strauss about the process. Pierce Brosnan lookalike, Paul Davies, head of broadcast and production at AELTC, Bethan Evans, broadcast manager, and the relaxed Tom Giles, broadcast technical manager, went through the highs and lows of the multi million pound project of the 20 year old broadcast area, that was completed with tech partner, NEP, which implemented a fully redundant IP network. When Giles was asked how he felt on the eve of the Championships, he did admit, “I was bricking it”. “I was pacing like an expectant father; that was the traditional stance for me,” he added. The panel went on to discuss UHD and HDR usage at Sky Italia with Manuela Baraschi, head of sport production at the broadcaster, as well as the speed of technological change. 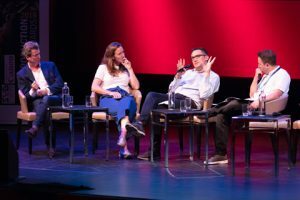 HBS’ Dan Miodownik, chief content officer, mentioned the issue of distribution of large file format types, as did Turner Sports’ EVP of technology, Tom Sahara, who said distributors needed to be pushed and helped in meeting these challenges. “We’re getting the infrastructure and people into the new workflows that will enable people to distribute 4K HDR or IP, and content from social on a phone or using low cost kit, or high end HDR productions, to end points. Viewing habits have changed dramatically. Now our content has to be made accessible across everything,” concluded Sahara. 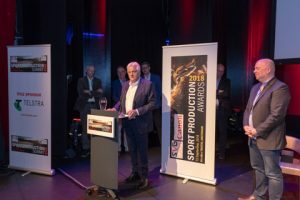 Finally, the Sport Production Awards 2018 awarded the following accolades: Outstanding Technical Achievement, Audio: NEP Netherlands – 2018 Winter Olympics; Outstanding Technical Achievement, Graphics: BBC Sport – FIFA 2018 World Cup; Outstanding Technical Achievement, Imaging: FIFA TV – FIFA 2018 World Cup; Outstanding Live Achievement: FIFA TV – FIFA 2018 World Cup; Outstanding Achievement, Digital: Formula 1 – F1 Esports. In addition, CTV Outside Broadcast chairman, Barry Johnstone, received this year’s Outstanding Contribution to European Sports Broadcasting Award. A much-admired figure throughout the broadcast industry, Johnstone has been a stalwart of sports and music production since the 1980s. Johnstone received his award from long-standing industry friend, CBS Sports EVP, innovation and new technology, and SVG Sports Broadcasting Hall of Fame chairman, Aagaard. 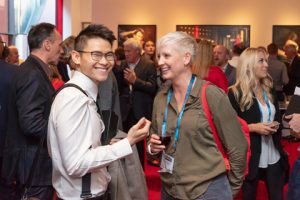 The day concluded with attendees going onto network at the DeLaMar Theatre with drinks and canapes.